It would be such a relief if you could stop worrying your child will never fit in. More than anything, you want him to follow his passions, whatever they may be. But you recognize his struggles and see the ways they hold him back. It’s true, she tries so hard. And she’s made drastic improvements on her own. But you’ve got to be honest with yourself, and you know it’s time to bring in a professional. You’re ready to finally get over the hump and see your child thrive intellectually, physically and socially with others his age. You noticed it early on and just thought it was one of your child’s little quirks. “He’s a little clumsy.” “She just needs a little more time to catch on to the sequence of things.” You repeated these phrases so often to friends and family they became automatic. At first, it was endearing and cute that your child toddled a little more than others his age. You brushed it off thinking maybe he was just a busy kid and so fascinated by the world around him that he didn’t want to concentrate on only one thing. Or that everything would just click one day, her focus would just improve, and she’d be surer of herself and more confident. Some days you’d see him tie his shoes, clean his room, or set the table and just know that he was doing fine. But on others, the comparison bug would bite you and you’d see that he was still so far behind her friends. Still, you waited. Not exactly sure everything would work itself out, but not exactly sure how to fix it or what to try. Now, a few years later, you find yourself worried you didn’t act soon enough. Following any kind of direction is the bane of your child’s existence. He would much rather read a book or watch TV than play organized sports with his friends. But it’s more than just not being good at physical things. Your child seems to struggle with the rules and sequences of the games his friends play. His difficulty being active, and processing multiple steps is starting to impact his relationships and it feels like you failed at helping him fit in. That’s not to say you only care about your child’s popularity or social life. In fact, you want her to be well-rounded and well-accomplished. You know there are things that will come more easily than others or things she will find difficult. You believe that all children are unique and have strengths and weaknesses that shape them into individuals. And, you want to help your child capitalize on her exceptionality and thrive. But what you didn’t expect was how much following instructions and being environmentally savvy would impact your child’s ability to make friends and have relationships with peers. You never imagined your child would be on the sidelines of every sporting event or playing alone at every social gathering. You had no idea that following simple sequences like tying her shoes or folding towels would cause her to meltdown or withdraw altogether. It was field day at your child’s school and you volunteered to help run the events, so you could spend a fun day outside together. You knew it might be a little challenging physically but felt that he would be up for it. He’d been showing interest in getting out there and running around a bit more, so you thought this would be a great opportunity. It was looking like a really fun day for the two of you until you saw him in the same environment as his peers. Every kid would huddle around the teacher for the instruction of each new game. They would go straight to their starting point and carry out the activities with zero issues. But when it was your child’s turn, you could see she had a hard time. It was obvious she either couldn’t remember the directions the teacher had just given her, or, she got distracted by all of the fun, noise, and activity that was surrounding her. Pretty soon the game was over, and everyone was moving on to the next. You could tell she was disappointed that she didn’t get to participate very much. The same pattern continued throughout the day’s event and it broke your heart to see your baby lack the focus to keep up. After the last game was over, many kids got trophies, but your child wasn’t included. You could feel the frustration radiating off of her and you knew she was ready to give up, retreat, and isolate herself. Your child is really floundering. Regardless of how long you wait or how much room you give her to figure it out, your child is still struggling to do the things her peers are doing. Never mind the fact that the differences are only getting more and more obvious. You absolutely thought she’d find her focus and outgrow some of her distractibility by now, and you’re starting to see that the “shiny object syndrome” is turning into a hindrance that will only grow worse if she doesn’t get the right help. It’s really painful to see your child struggle when all of his peers seem to be thriving. There is so much pressure to reach certain achievements and hold certain standards and you just don’t know how you’re going to meet these requirements without getting him to think and process his environment in appropriate ways. But the truth is, there is no “right” track and kids don’t come with an instruction manual. It’s difficult to make strides with your child when you’re unsure what the exact problem is. Addressing sensory processing concerns is not a one size fits all approach. It requires specialized evaluation and individual plans to ensure you are meeting your child where she is and addressing her particular struggles. The Interactive Metronome is an evidenced-based and research-based training program that improves cognitive and motor skills by helping your child overcome attention, memory, and coordination limitations. We will meet together 15 -21 times to complete individual Interactive Metronome sessions. Each session takes between 45 – 60 minutes and takes place at least two times per week. However, IM is most typically offered as part of a larger package of programs that include the Sensory Learning Program, Cognitive & Memory Training and Neuro/Bio/Educational Feedback. Although IM works for people of all ages who have a variety of conditions affecting their cognitive or physical abilities, it is uniquely designed to ensure your child recognizes his progress as it is occurring, increasing his motivation toward therapy and his ultimate recovery or gains in ability. The Interactive Metronome Program can also be used with children without a specific diagnosis to enhance cognitive and athletic performance. Interactive Metronome sessions are available seven days a week as a standalone therapy service or as part of larger programs held at the clinic. 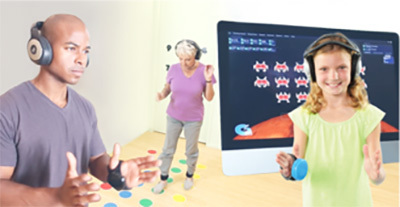 The Interactive Metronome Program is best for those who need help with attention, processing, and memory. The program helps children focus on multiple-step processes without forgetting the sequence or having to be reminded what comes next. It is possible for your child to enjoy challenging situations without feeling like he is behind his peers. He will be able to have fun intellectually, physically, and socially with children his own age and not struggle to fit in or feel awkward. You will be able to step back and let him be a kid, trusting that his ability to process his environment is strong enough on its own. Simply because your child has difficulty remembering and following sequential steps, does not mean that she cannot train her brain to get better at processing directions. You will be able to send your child to school knowing, the more intricate her assignments become, she will develop the coping strategies to keep up. She will learn to focus in a way that meets her needs and helps her pay attention and succeed. Ultimately, you can finally relax knowing that your child will find ways to be successful no matter what challenges they face in life.